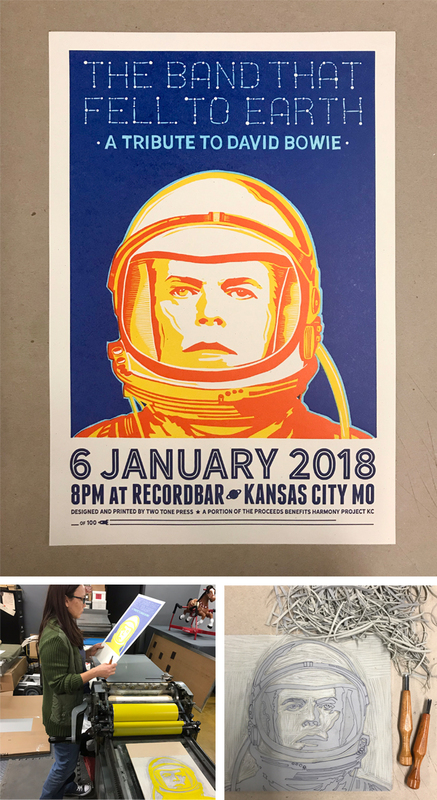 Thirteen years ago, printer and illustrator Michelle Dreher began the roots of Two Tone Press in Kansas City, Missouri. 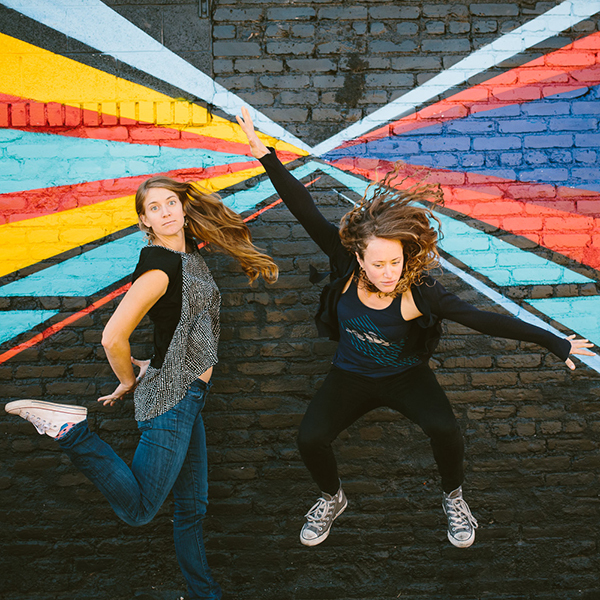 Joining forces with her sister, Angie, who helms the business side, brought exciting changes. 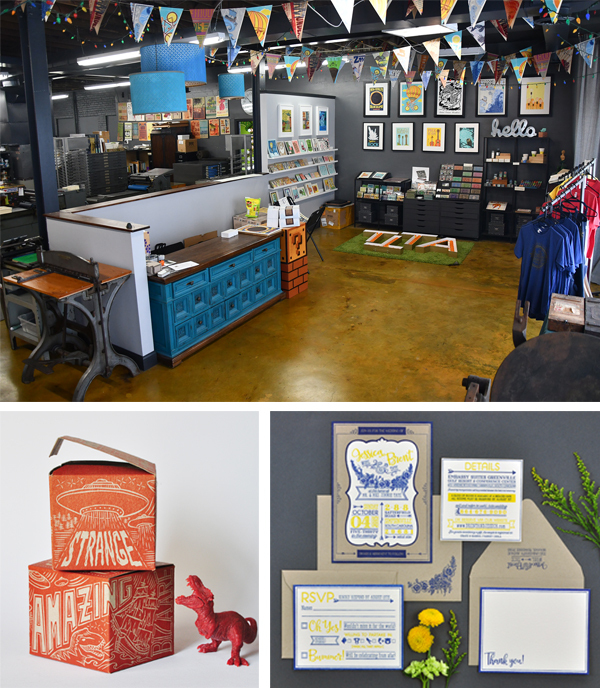 It catapulted the growing letterpress print shop into a well-run machine full of creativity, fun & eye-catching prints and cards. 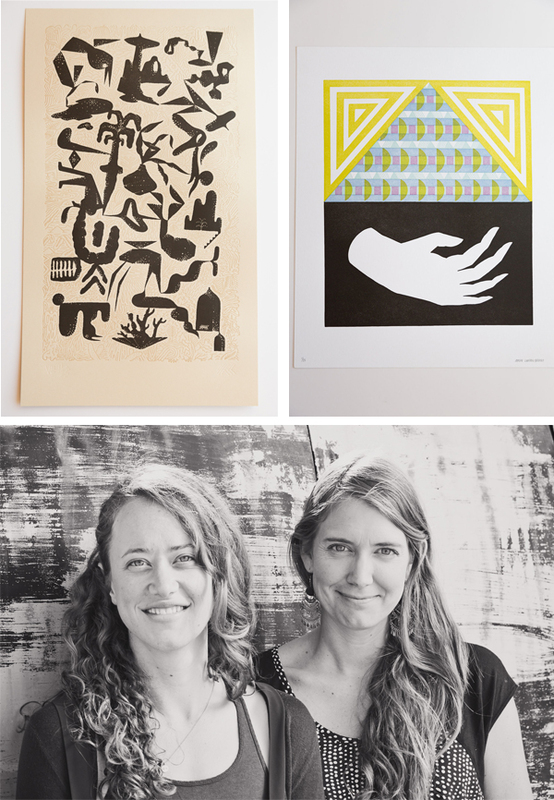 They branched out with their blossoming printmaking community workshop. 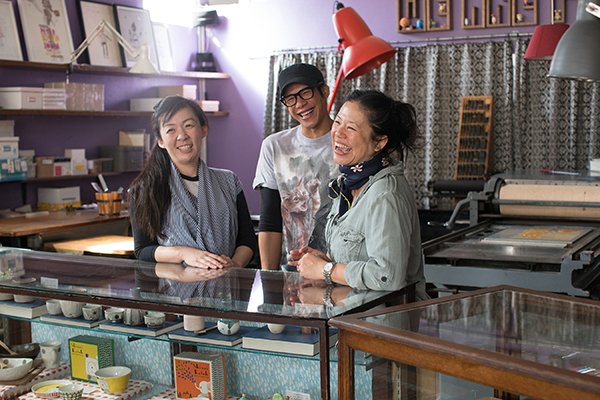 Michelle recounts the adventures of buying a building, expanding her studio for her sky-high printing visions, and what’s just around the bend. I grew up in a military family, so we moved around a lot. We lived in Germany and South Korea for several years before ending up back in the US. I later came to Kansas City to attend the Kansas City Art Institute and loved the city so much I never left. At the Kansas City Art Institute, my degree was in illustration, but I spent a couple semesters in printmaking. While there, an interim instructor introduced me to the Vandercook. I immediately fell in love with its hairline precision and registration which made multi-color relief printing so easy. I started Two Tone Press in 2005 in a super-drafty warehouse loft on the top floor of an industrial brick building. I was later joined by my sister Angie in 2011 after buying a building in a soon-to-be up & coming neighborhood. 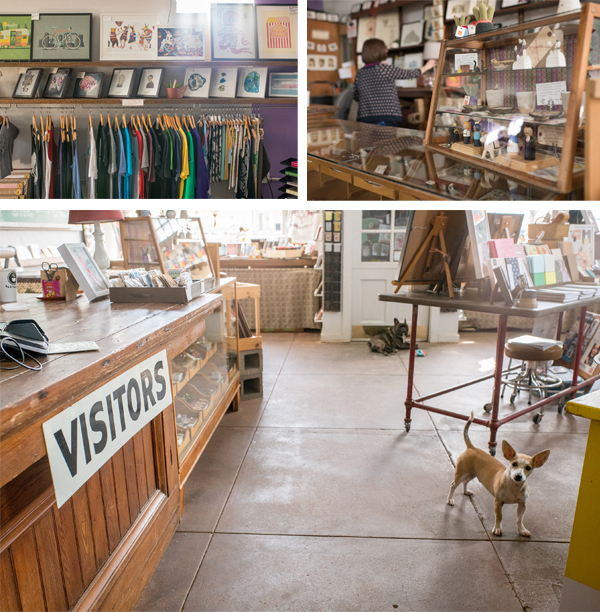 She has a business background paired with a love for art and helped whip this place into shape. 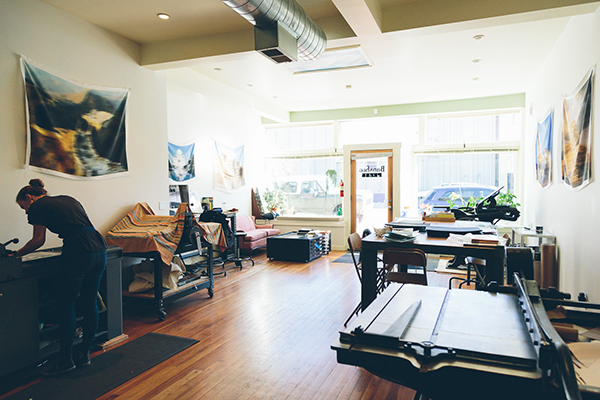 Together we built our own studio with a modest storefront and lots of open space and high ceilings. It’s been a long eight-year renovation journey but the studio is finally taking the shape of our initial vision. When I purchased our building, there really wasn’t much going on around us. 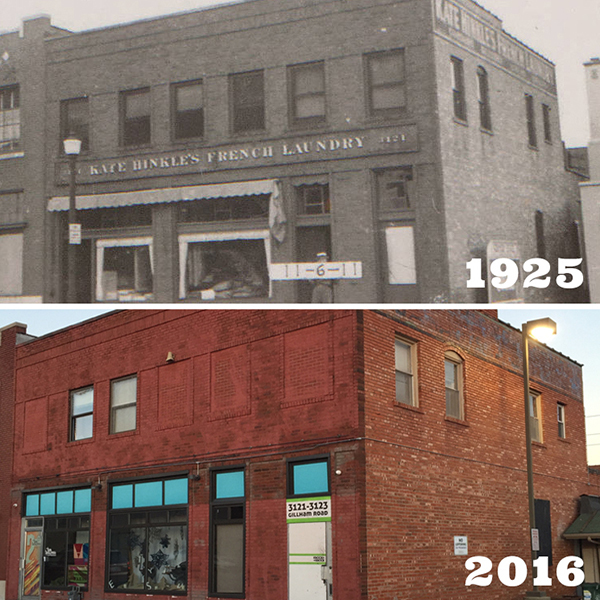 It has since started to flourish with other creative-minded folks who have banded together to build our own unique neighborhood. We even named our new area TowerEast District based on the very orange and prominent tv tower right next to us. It’s been interesting being a part of something new. My passion lies in creating colorful relief block prints so I draw inspiration from my peers in the field. 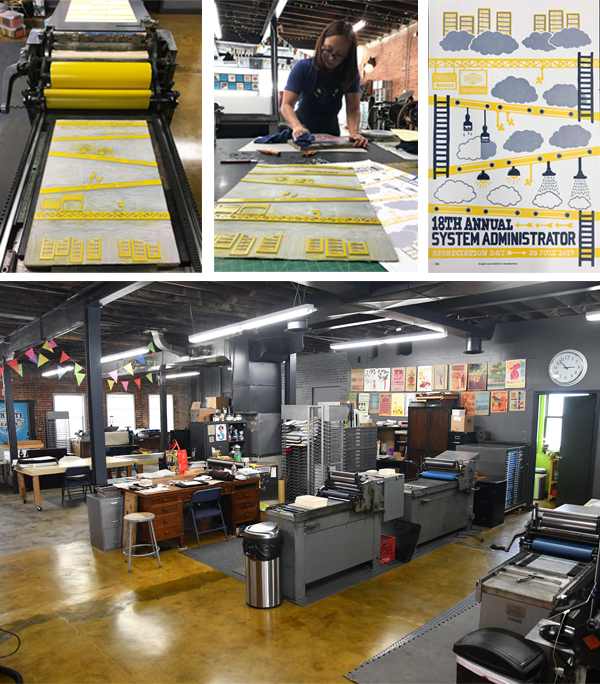 Our favorite shops are The Firecracker Press in St. Louis, MO and Tugboat Printshop in Pittsburgh, PA.
Two Tone Press is where I spend most of my time, but I do love to teach. I have been a part-time studio art instructor at the Nelson-Atkins Museum of Art for over 10 years. 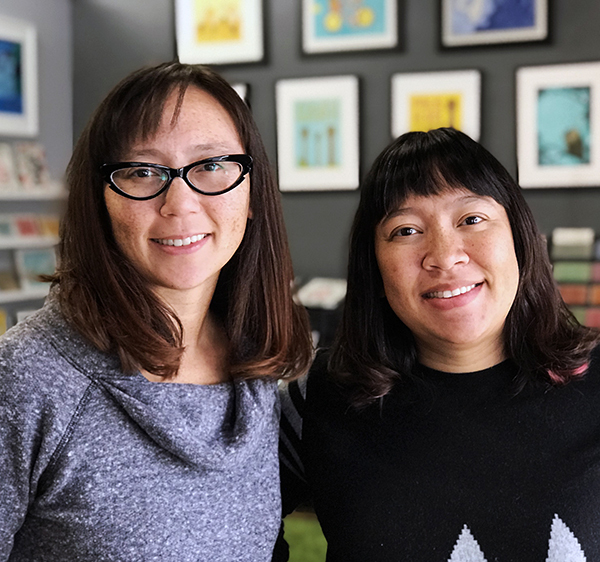 And just last year in 2017, my sister and I along with another colleague, Ani Volkan, started our own community printshop called Print League KC. 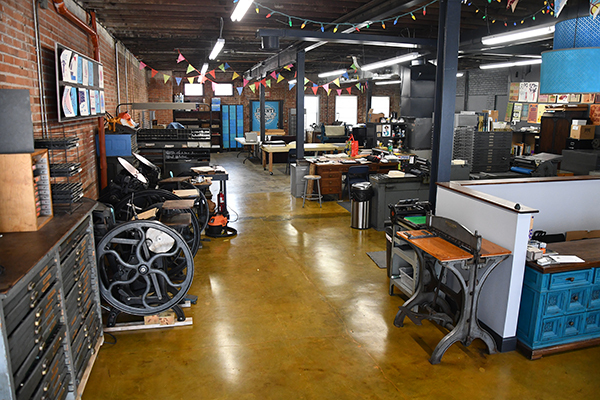 It shares the same studio space as Two Tone Press. 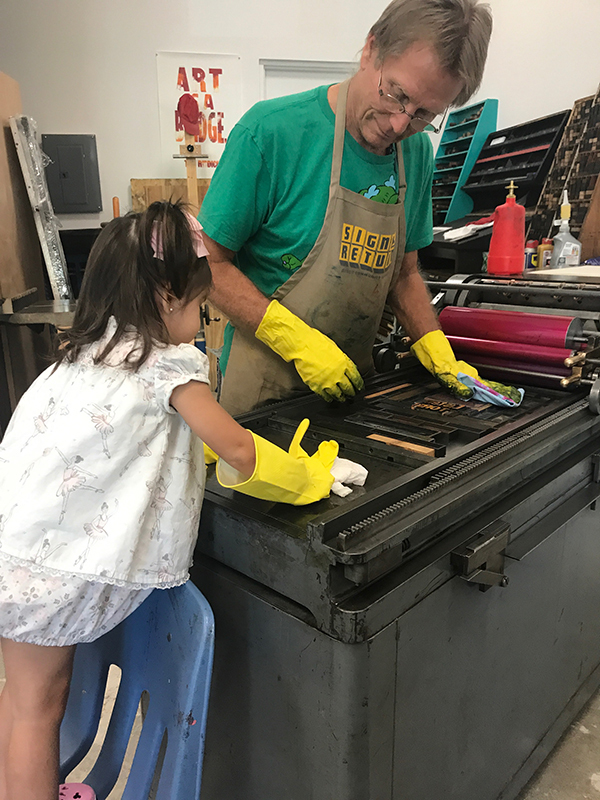 In addition to letterpress, Print League KC offers workshops of other print processes such as etching, lithography, and silkscreen. 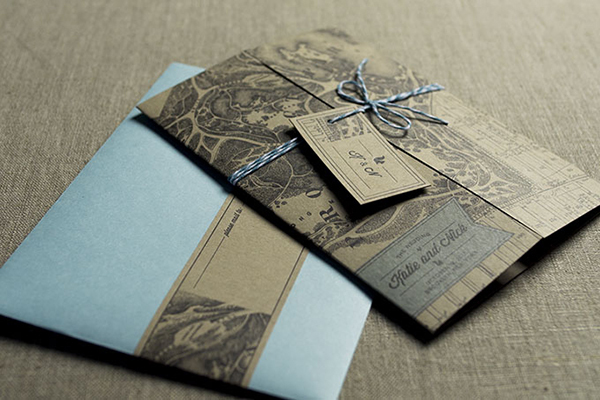 At our studio, we create everything from custom wedding invitations to business cards. 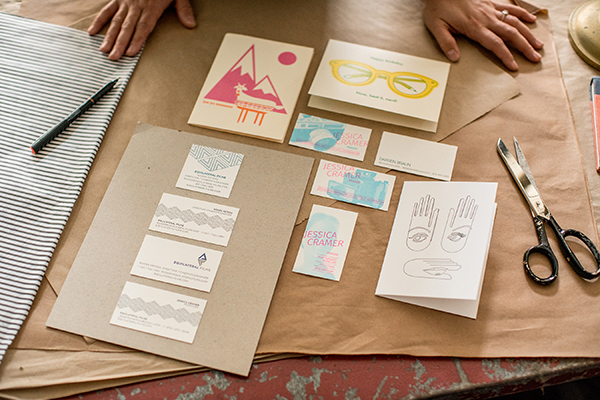 When there’s “free” time, we create our own line of colorful poster prints and cards. Due to my illustration background, I tend to incorporate hand-carved block images where I can. With the immense support of my family, buying my own building to create our unique studio was a huge accomplishment. 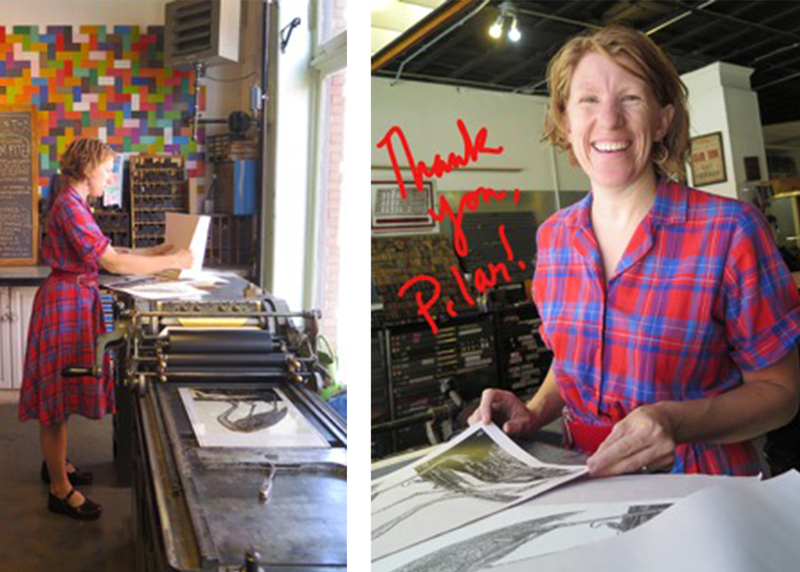 And later, being able to give back by starting a community printshop felt really good. I enjoy sharing my passion for printmaking with others. I gained a lot of experience working at another local print shop, Hammerpress, for several years after I graduated college. Then in 2004, Brady Vest, the owner of Hammerpress, offered to sell me a Vandercook No. 3 for $400. I jumped at the opportunity. It was a clunky machine that had no motor and a funny little hand crank to distribute the ink. Once I started my own studio, I later traded it for an SP15 from Indianapolis which is still my favorite press to this day. We started by using metal-backed polymer plates that we spray-mounted to MDF boards. This made precision printing challenging because the boards were never perfectly flat. Then in 2013, my sister recommended we finally invest in a Boxcar Base so we bought the biggest one that would fit on our Vandercook, a 19×13. I can’t even express how much it changed our whole world by making setup so much faster and easier. The grid marks were totally worth it. I’ve never regretted the purchase for even a second and can’t believe I didn’t invest in one sooner. 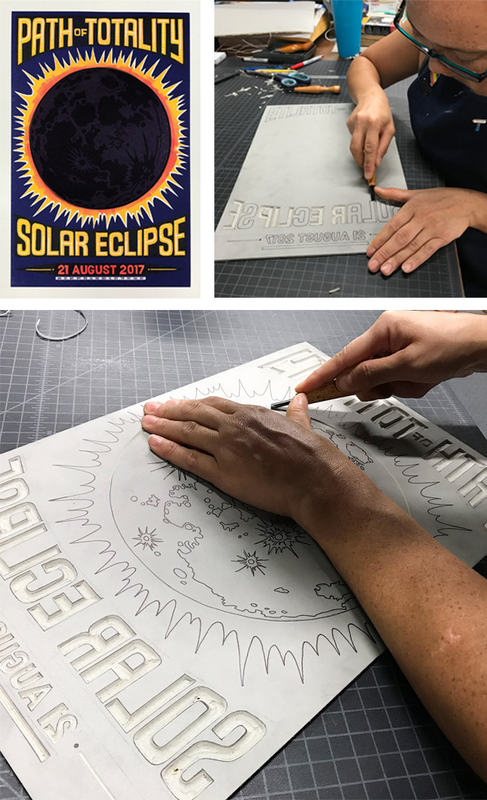 Here is one of our useful letterpress printing techniques. 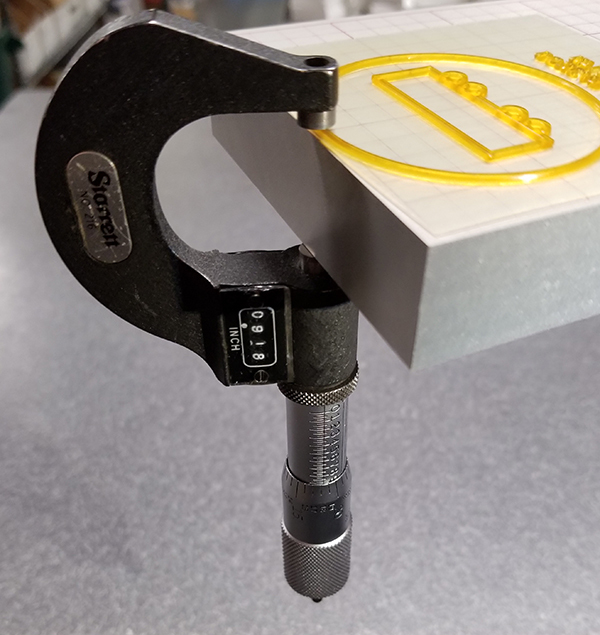 We like using a sheet of mylar on top of the tympan sheets around the cylinder to keep a clean surface and then we also like to use removable sticker paper on it to bump up certain areas of the print. 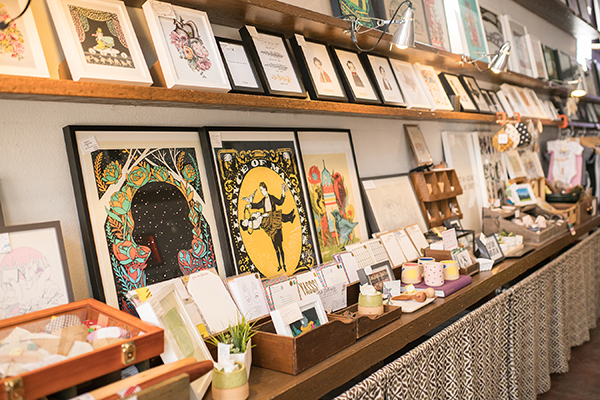 We look forward to expanding our store to offer print work from all over the world. We also recently bought the building next door which now has a gallery space on the second floor. 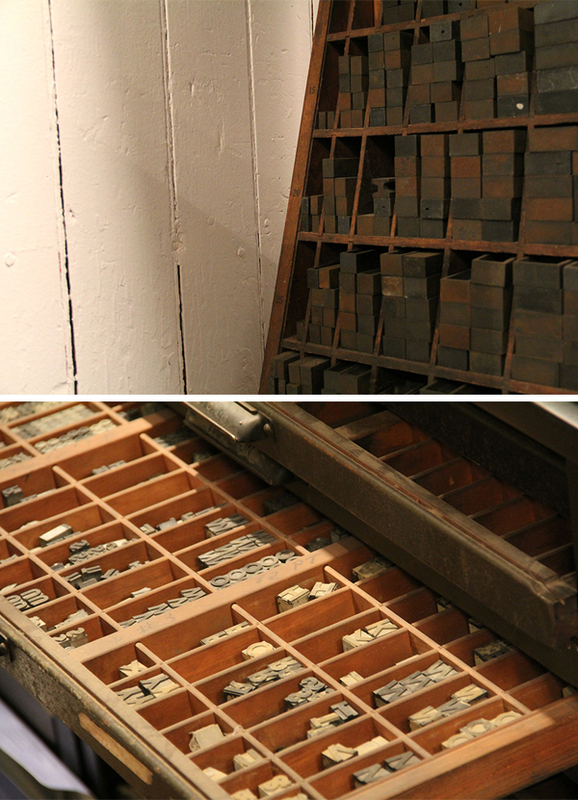 We’re excited to put together interesting exhibits that will include letterpress and other print work. 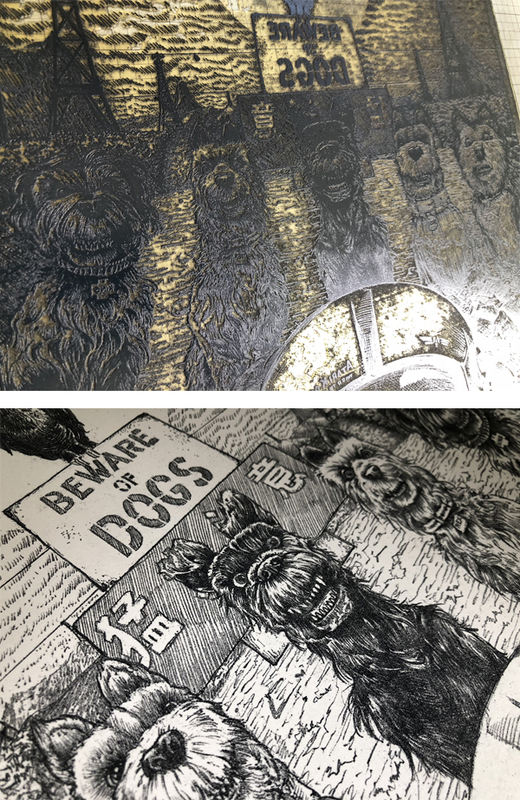 As soon as AJ Masthay’s “Isle of Dogs” print passed through our platemaking department, we had to know more. Discover as we catch up with AJ of Masthay Studio, and this sneak peek. Find out what is the inspiration for this ultra-detailed piece… and where can you enjoy this piece. 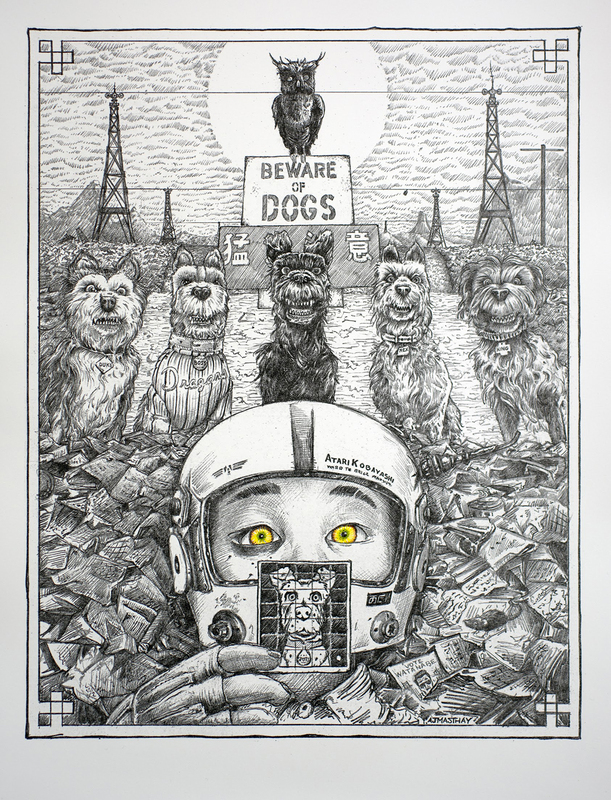 “Spoke Art is pleased to present the Isle of Dogs Art Show. This is an officially licensed art exhibition tribute to Wes Anderson’s most recent film. The dynamic group show features over one hundred artists, painters, sculptors and print makers, debuting one weekend only in New York City’s Lower East Side. I personally love the quirky works of Wes Anderson and am a huge dog lover. I have two very spoiled Labrador Retrievers Dexter & Halley. When asked to participate in this exhibition I immediately said YES! My piece features the main characters from the film, both human and canine. As well as, the scene in which they debate whether to attack. Spoiler alert – they realize he has come searching for his own dog “Spots” and decide to help him in his quest. The print is a reproduction of a detailed graphite drawing utilizing a Boxcar Press’ photopolymer plate with a 133 LPI halftone screen applied. We’ve found that once dialed in on our Vandercook Universal III, these halftone plates reproduce tonal drawings beautifully. They come very close to the detail typically found in lithographs. To mimic the graphite work we do the following steps. First, we mix a fairly stiff, dark gray ink with a touch of brown to warm it up a bit. Next, we use a paper that is soft and supple, such as Arches 88. Finally, we finish the piece with a hint of hand-applied color in the pilot’s eyes. As a result, this slight variation adds a personal touch of individuality. The hand coloring piece complements the printing perfectly. The Final Edition size is 100 signed, numbered and titled, 15”x20” on Arches 88. Prints are available to purchase at the event. Remaining prints will be made available online following the event, through SpokeArt. The Isle of Dogs Art Show group art exhibit is running from November 9th, 2018 – November 11th, 2018. For more details, check out their Facebook page here. 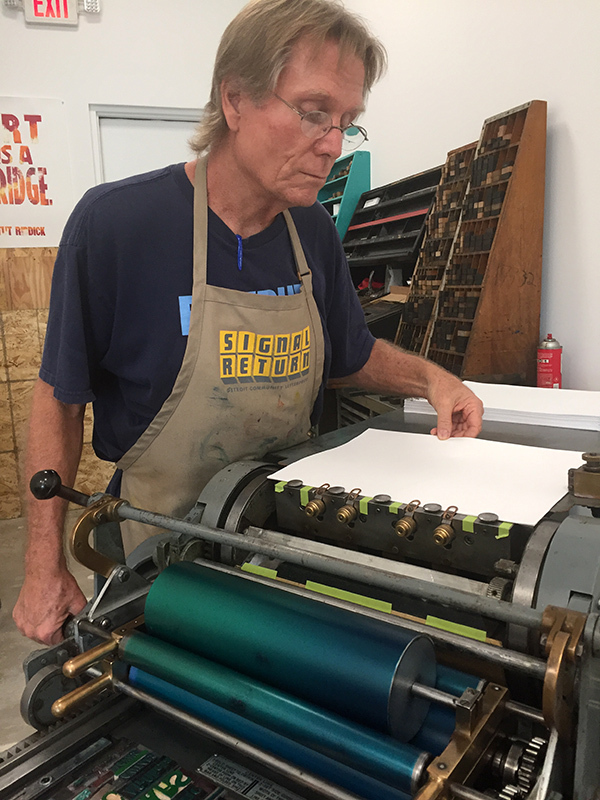 From Midwest to Miami and to teaching art by-day and printing-by-night, Tom Virgin of Extra Virgin Press weaves a letterpress journey of printmaking. We caught up with Tom after hours on what makes his printing clock tick, the tales of teaching art in the high-school classroom, and the excellent food fare that is a must for a late night printing session in Miami. 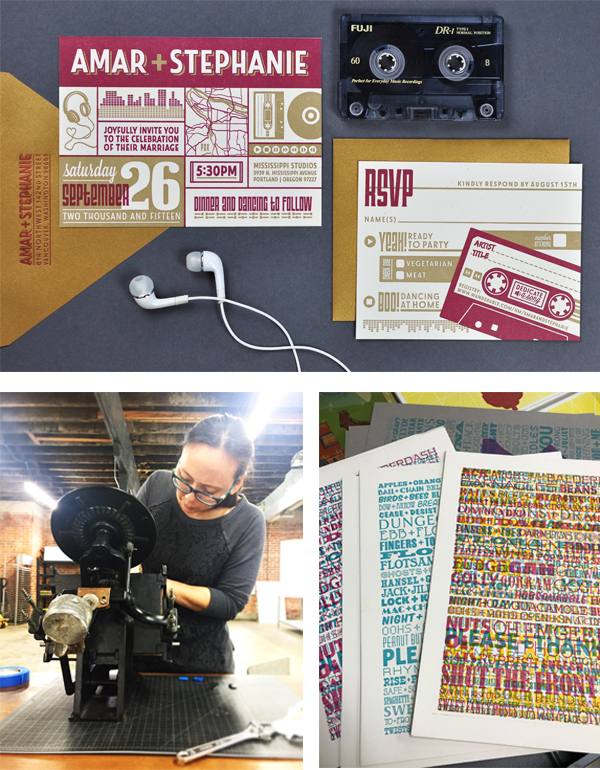 PRINTING, SLUGS & ROCK’N’ROLL I was born and raised in the Midwest, just outside of Detroit. Fueled by blues, jazz, Motown, and rock & roll, I made my first print in 1972. I am now in my sixth childhood, having spent twice as much time in South Florida than in my native Great Lakes State. I quickly realized my mistake, reset the type, and reprinted. I decided the typo was more in the spirit of the original quote, and returned the position of the second “e” to the first version. This is my first love of letterpress story. THE PRINTING TRANSITION I am a bookworm (and a storyteller). Printmaking eventually led me to book arts. The ability to create archival editions from press printed text and images was what made me finally get into letterpress. 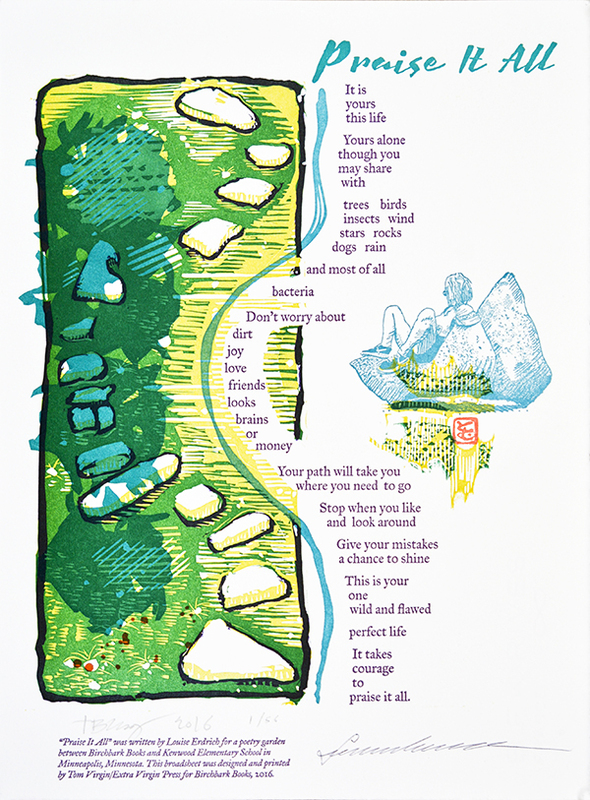 I have always worked in communal studios as a printmaker, so the transition to letterpress was a natural step. 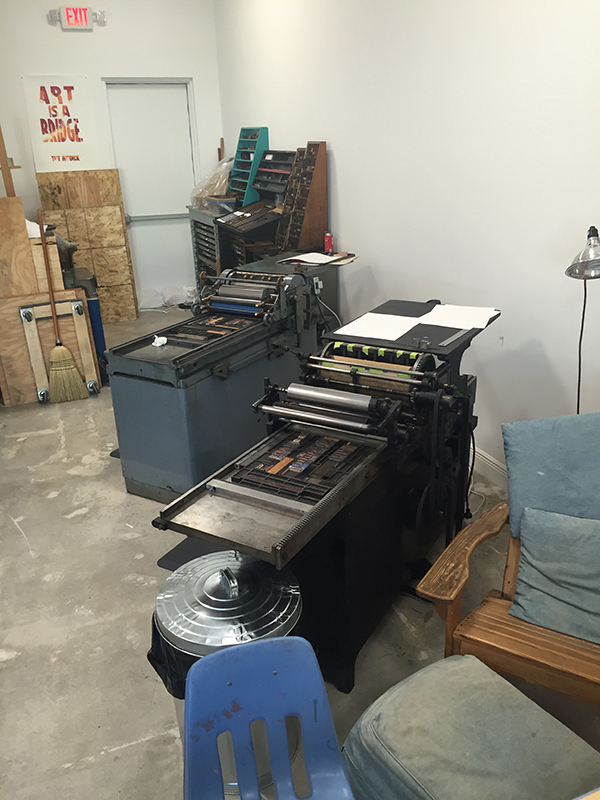 The first presses I printed on solo, were at the Jaffe Center for Book Arts in Boca Raton, Florida. Arthur Jaffe bought my very first book for the Jaffe Collection, and mentored me for the rest of his life. SPLENDID IN THE SUNSHINE STATE Nestled in the middle of Little Haiti just north of Downtown Miami, I am a five minute drive from Korean fusion BBQ, Haitian cuisine, Thai food, awesome burgers and, right next door, Clive’s Jamaican Jerk Shop. Four blocks away is the Little Haiti Cultural Center. I am a white guy in Miami, living the cushiest minority experience on the planet. 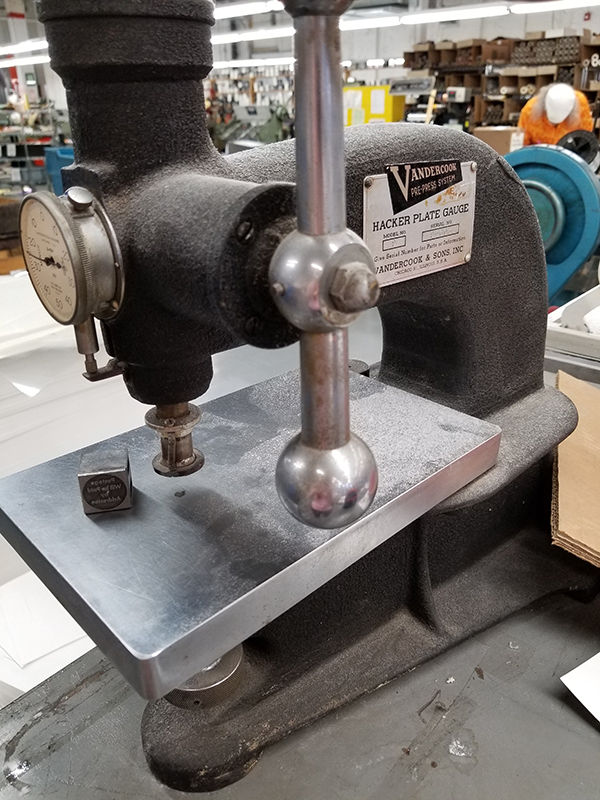 Extra Virgin Press has a Vandercook 4 Proof Press (formerly owned by Gaylord Schanilec, and lovingly donated to EVP by Regula Russelle of Cedar Fence Press- both from the Twin Cities in Minnesota). Our second press is a Challenge 15KP. 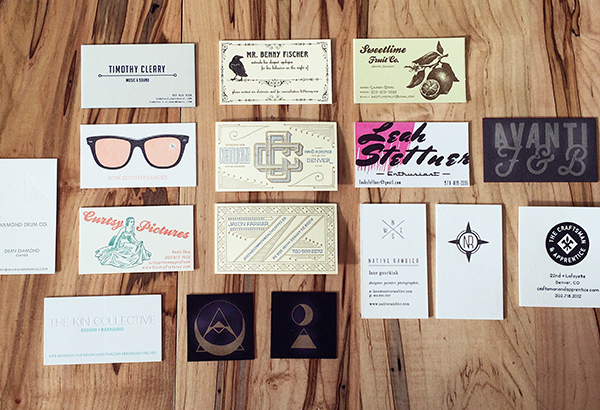 Both presses are bringing back letterpress printing to the Miami community. The presses keep me from eating all of that amazing food, every waking hour. PRINTING MENTORS I am fortunate to have had many teachers and mentors, all of whom have contributed mightily to my printing practice. I am especially indebted to Arthur Jaffe, who welcomed me to the Jaffe Center for Book Arts, and John Cutrone (Convivio Books/Jaffe Center) in South Florida. Stephanie Shieldhouse at Highway Press, in Jacksonville, Florida gave critical support when Extra Virgin Press became a reality in 2016. In Red Wing, Minnesota, in my home-away-from-home, the Anderson Center at Tower View, I have been well schooled by the proprietor of Red Dragonfly Press, Scott King. Scott and Robert Hedin, the retired Director of the Anderson Center also introduced me to Regula Russelle (Cedar Fence Press), Chip Schilling (Indulgence Press), Monica Edwards Larson (Sister Black Press), Amanda Degener (Cave Paper), CB Sherlock (Seymour Press), Gaylord Schanilec (Midnight Paper Sales), and Richard Stephens, all from Minnesota Center for Book Arts, one way or the other. Moe Snyder and Maria Cardenas set me straight in Portland, Oregon. Many others have lent me assistance and support. GETTING INSPIRED My Instagram feed is a constant inspiration. I follow all I can find. Regula’s Russelle’s books offer me a sublime view of the world of color that helps me escape from black and white woodcut prints. (Mary) Bruno Press, another Minnesota great, keeps me smiling, Amos Kennedy in Detroit offers a powerful moral compass, and damn fine work to back it up. Another Motown great is Signal-Return. When I grow up, I hope to create a community of dedicated printers like Lynne Avadenka has, in Downtown Detroit. Can I just say, “Hatch Show Print in Nashville?” Writers have enriched my life immeasurably. THE CREATIVE PROCESS My visual arts practice included printing, painting, drawing, book arts, and public art, prior to my entry into letterpress printing. Teaching a full spectrum of arts classes in Title I Public High Schools in the fourth largest school district in the United States helped me with design. I suspect the students teach me more than I teach them. My colleagues in grad school, as well as fellow Professors, Adjunct Professors, and working artists have helped me to bring some skills to the letterpress world. PART TIME PRINTER, FULL TIME FUN At this point, I am printing after school and on weekends. That is the bulk of my waking hours. My retirement from the public schools will make it possible for me to print full time. PRINTING FEATS —In 2006 I received the Florida Artist Book Prize for Right There, an artist’s book about Sleeping Bear Dunes National Lakeshore, and a semi accurate account of my childhood in Michigan. –I have taught five or six thousand teenagers about art. 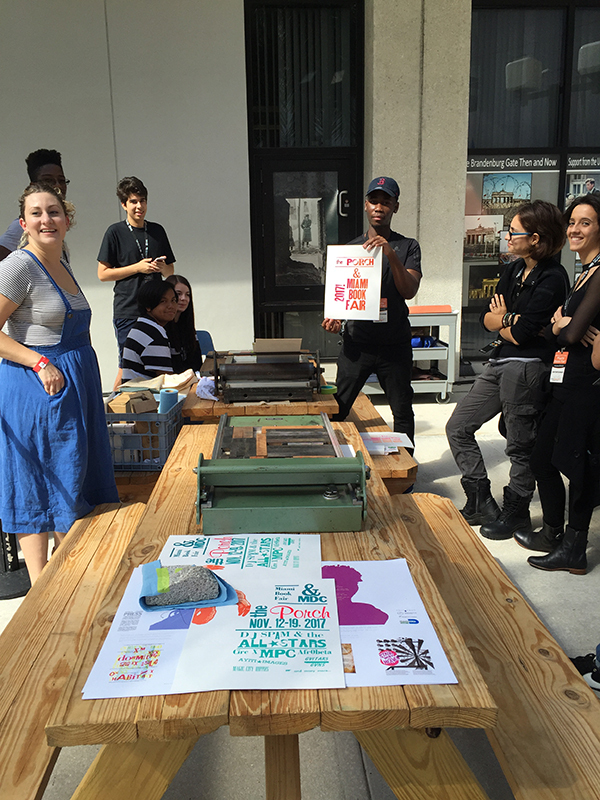 –Extra Virgin Press has received support from the Knight Foundation, Cannonball Miami’s Wavemaker/Long Haul Grant, Miami Dade County Cultural Affairs, and the Miami Foundation, in its quest to bring letterpress back to Miami. PRESS HISTORY [My very first press was] a Vandercook 4 Proof Press, Serial #13622. BOXCAR’S ROLE Cathy and Rebecca make it possible for me to function in a letterpress world, answering far more questions than can be reasonably expected. The words on the website about setting up a letterpress shop are revelatory. Thank you Harold and Company. SHOP (AND LIFE) TIPS I am still learning, but you will be the first to know. WHAT’S NEXT I look forward to more printing, more books, more kids, more grant applications, and teaching new printers, so that I can run both presses every day. A triple round of applause & thanks out to Tom Virgin of Extra Virgin Press for letting us take a sneak peek at his wonderful + tropical printing world! When the intricately-detailed illustrated flamingo graphic passed through our platemaking service, we were eager to learn more about what was to become of this plate and the resulting final pulled print. 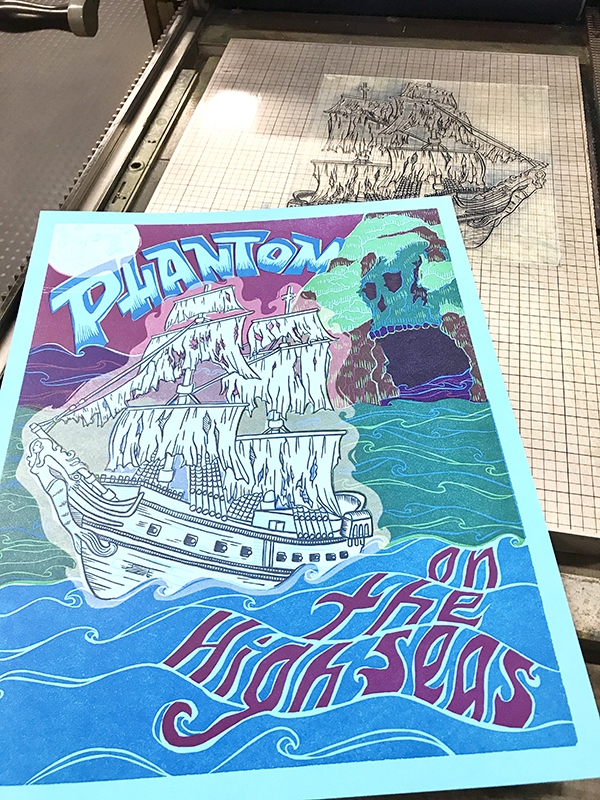 The printer behind the design, Dana Kadison, let us in on how the illustration project came to be and how she turned a long-mused-over concept into reality. 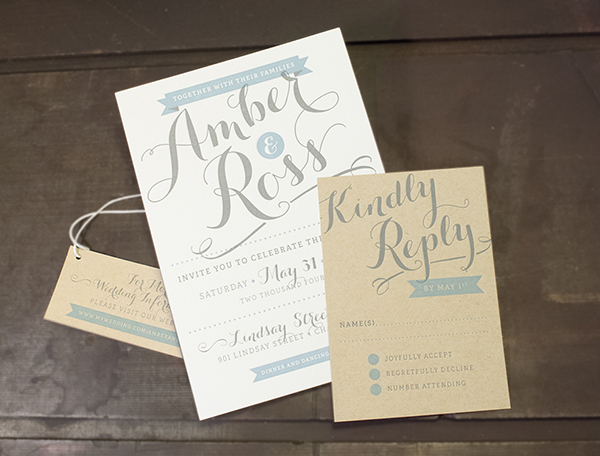 “Letterpress is an aesthetically and physically freeing experience. We all know that paper is not really 2D, that it has depth. 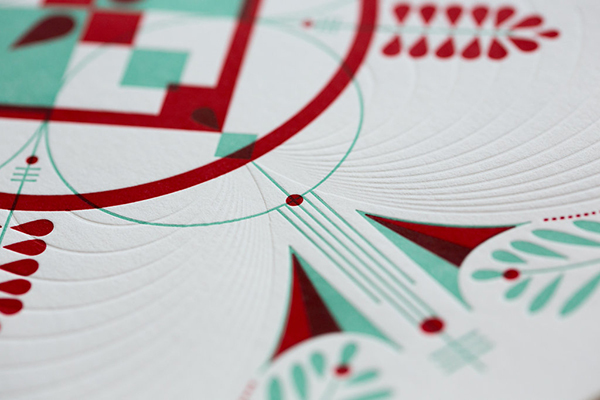 Letterpress layers add visible texture that can be seen with or without ink. And a letterpress registers. It is a little unsettling to use a press, completely unlike pulling the screens myself. 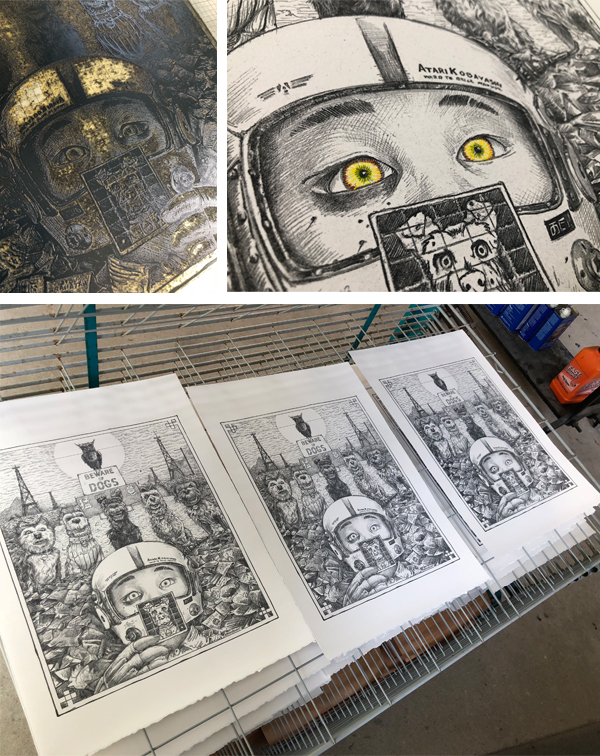 Atmospheric conditions in the NYC studio are so variable and water-based inks misbehave in such interesting and frustrating ways that achieving consistency in CMYK prints takes great physical and mental stamina. A large heaping round of thanks out to Dana for letting us get a sneak peek at the brilliant flamingo designs! 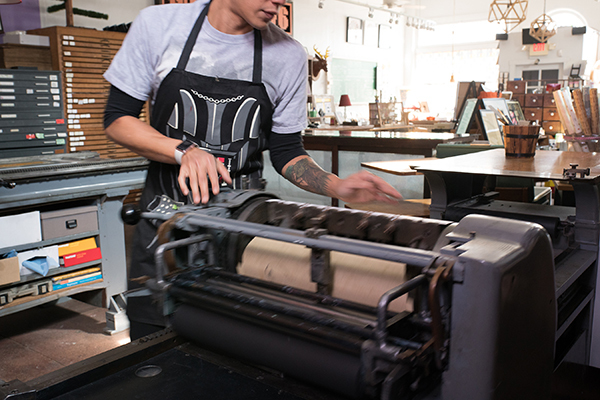 Jason Dewinitz of Greenboathouse Press, is a fine press printer who hails from Western Canada. He is also an award winning book designer who has thrown open his studio doors to give us this friendly and laid back tour. His current studio isn’t on a waterway anymore, so for the interesting background story on the name, read more here. THE LOCATION Greenboathouse Press is located in Vernon, British Columbia, a year round tourist destination in the lower southern region of BC. The workshop is attached to the house and is 20 by 24 feet (480 square feet), otherwise known as not big enough. While I certainly appreciate the community that a shared space offers, I prefer to work alone (or with an apprentice), so I cherish my private space. EFFICIENTLY PRODUCED SHOP I was going to say my space is simply a glorified two-car garage, but “glorified” is a bit of an overstatement. The upside of a garage is, of course, the garage doors, but in my case it’s also helpful that both the electrical panel and furnace room are off the garage, as I needed to run a 220V line and running water to my Monotype Super Caster. The ground-level entry and concrete floor are also great, considering that the casting machine likes to spill molten metal all over the place. As for a floor plan, as can be seen in the photos, I’ve set up a number of workstations, for cutting paper, setting type, printing, casting, and working on machine bits & pieces. Although every square inch of space is taken up, it’s an efficient and reasonably comfortable area conducive to getting things done. FAVORITE THING ABOUT THE SHOP I’m pretty fond of every single thing in the shop, likely due to the fact that only about 30% of my equipment is currently set up there. The bulk of my stuff is at the print shop I’ve set up for my students at Okanagan College, so what’s in my shop at home is the best of it. 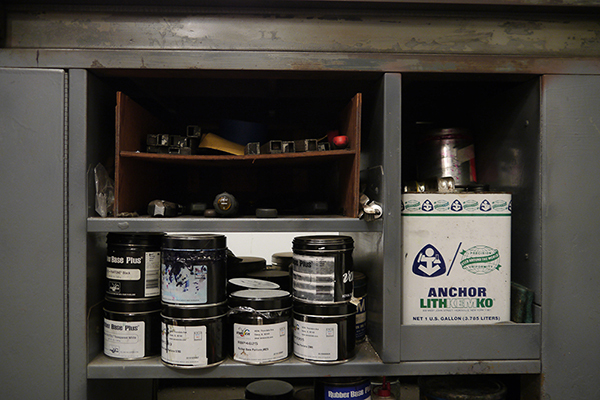 Aside from the machines and tools, likely the two features I appreciate the most are the long work bench at the back of the shop (for setting type) and the shelving unit behind the press, which holds all of the stuff one needs while printing (ink, reglets, leads/slugs, furniture, tools, etc.) at arm’s reach while printing. 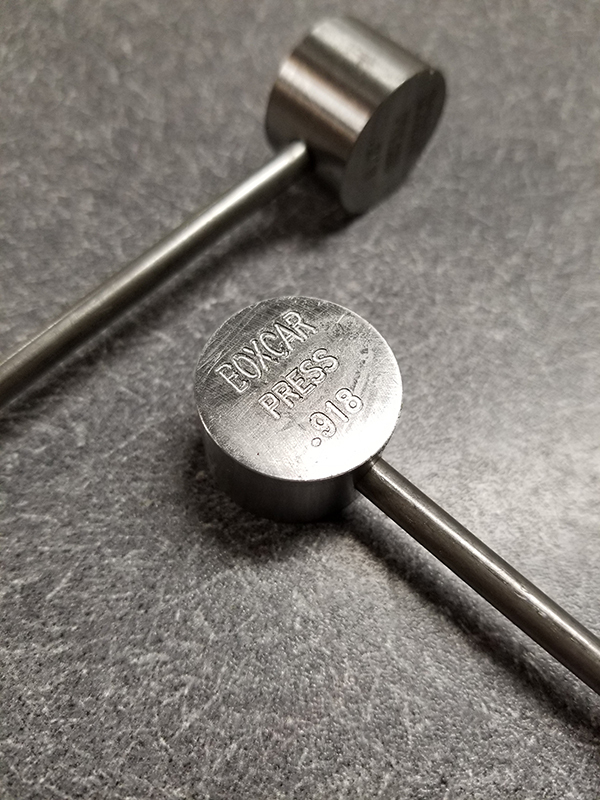 PRESSES I work almost exclusively on a Vandercook 15-21, the adjustable bed of which is crucial in my shop given that I have quite a bit of European type that’s not .918”. At the college shop I also have an SP-25 Power and a giant 14.5” x 22” C&P. I’ve had a couple of SP-15s pass through as well, which I sold to get the SP-25, although I’m currently looking to sell the 25 in order to get my hands on a 219 or Uni III (I need another press with an adjustable bed, and the 25 is simply more than I need in terms of size). MOST VALUABLE SHOP TOOL Where to start…value, of course, being relative, I have a handful of tools that are worth a fair penny, and a few of those are also extremely valuable to me in terms of utility. At the top of the list would probably be my point-micrometer, which is one of only a handful in existence that measure in (North American) typographer’s points, with increments of 1/16th of a point. This is extremely handy for casting type, but also great for simply measuring type & spacing while setting & finalizing forms. Next to this would be a good alignment gauge and lining gauge, both used for casting. In terms of printing I’d have to say my favourite tool would be a pair of stamp-collecting tweezers that are ideal for pulling out sorts & spacing when correcting forms. And, by the way, I can’t seem to find these things anywhere, so if anyone has a source please let me know! FAVORITE INK & COLOR When I inherited my first press & etc. from Caryl Peters (of Frog Hollow Press in Victoria, BC) with whom I very informally apprenticed, she also passed along two partial cans of a black ink that has, in my experience, no equal. It was a formula developed by Stephen Heaver and produced by Hostmann-Steinberg. The stock is long gone, but even after 14 years in the can, the stuff prints like nothing else I’ve worked with: perfect viscosity, deep, rich but matte black, and holds up for hours on the rollers. My two cans are almost gone now, so I contacted Hostmann-Steinberg in Canada who pulled the formula up from their US division and they were kind enough to make a big tub of the stuff for me, but I have to say it’s just not the same. I’m pretty sure they scrimped and used synthetics, and the new formulation is far too thin and soft. I’ve found, though, that if I work some out on the glass and (gulp) leave it exposed for about 3 days, then skim off the top skin, it works pretty well. Wish that I could find a stash of the old stuff though! CLEAN-UP ROUTINE I have a very simple wooden cradle that holds both my oscillating and rider roller carriage, as well as my two rubber rollers, and this makes clean-up pretty easy. I use California Wash, mixed 50/50 with water, and paper towels to get most of the ink off, and then do the final cleaning with straight Wash and clean rags. I’ve got clean-up down to about 15 minutes. I use a lot of heavyweight Bounty paper towels, and chopped up old cotton sheets for rags. OIL OF CHOICE I use pretty much any non-detergent oil, I’m not fussy as I use very thin coats on the rails and just a few drops in the oil holes. BOXCAR BASE + PLATE SYSTEM I use the standard Boxcar base with standard plates. As I’m not doing job work and thus don’t feel the need to pound deep into chipboard, this simple configuration has worked very well for me. My most challenging job with polymer thus far was the Feliciano book, which was an alphabet book with each letter having two fill plates and a stroke plate with VERY fine lines. The registration was near impossible, but the plates did their job and the results were darn solid (see images). PIED TYPE It all goes in the casting machine. Last summer I melted down over 2,000 lbs of old type and cooked them into fresh ingots for the Super Caster. Now there’s a fun job. PRINTING TIPS Roller bearers. 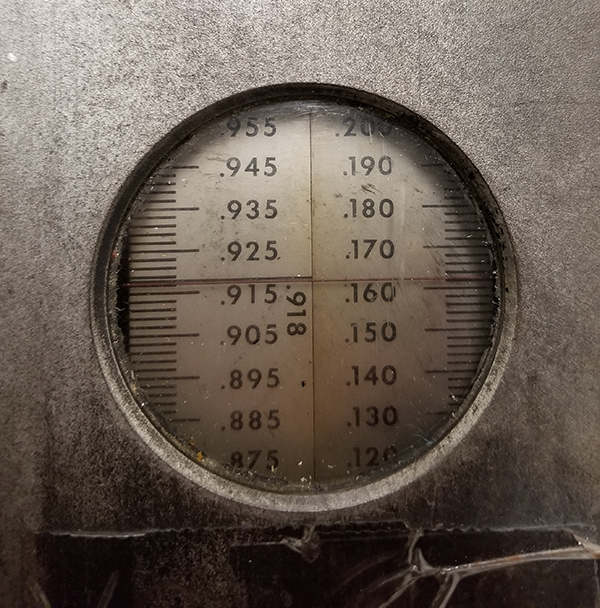 Sure, the Vandercook allows for careful height adjustment to the rollers, but that does nothing for maintaining inking with uneven or gapped lines of text. Bearers actually control the height of the rollers, and can be taped here and there to address the text arrangement. And, change your packing/tympan with every new form. And, keep your press clean. I’ve seen presses that look as though they haven’t been cleaned in decades, and the result is always crappy printing. And one last secret: keep the ink light on the press, just a kiss of contact between roller & type, and then double-ink every pass. 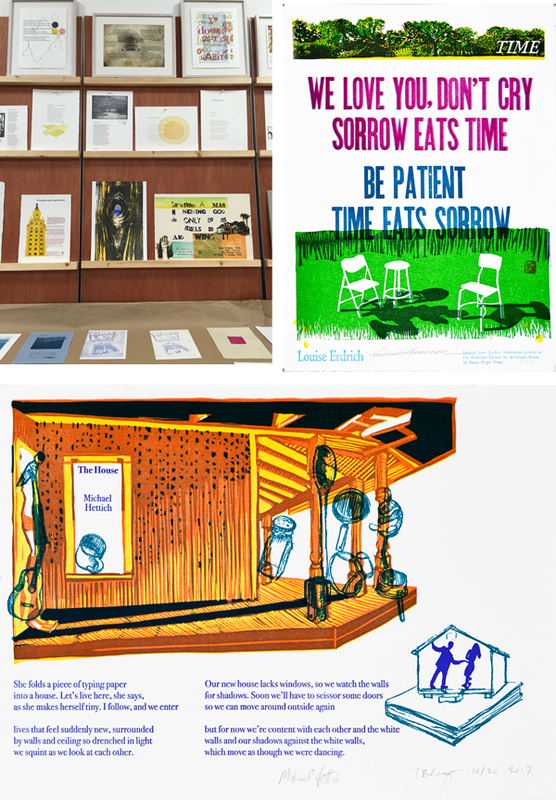 Many thanks to Jason for this look inside the Greenboathouse Press! 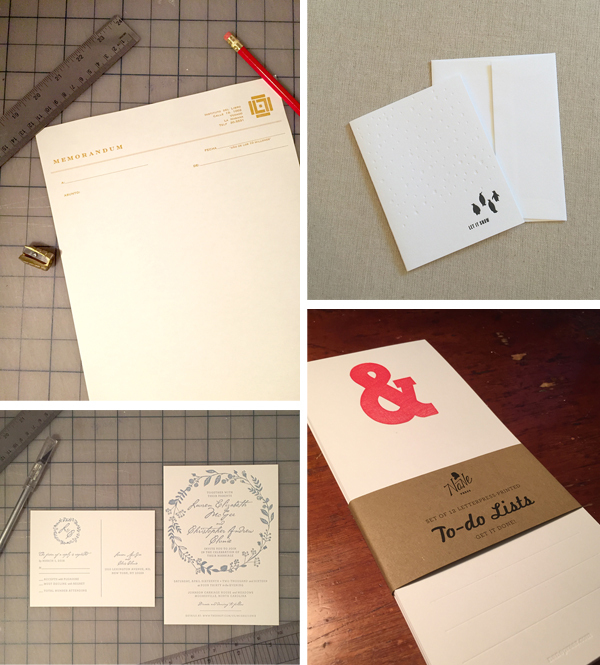 Visit Jason’s Pinterest page to see more of his presswork. 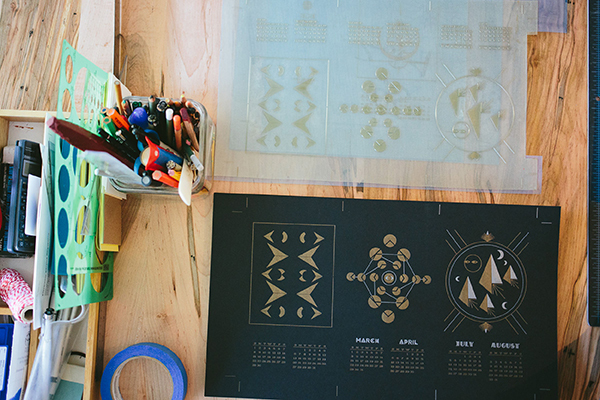 Part-time printing doesn’t have to mean small design. 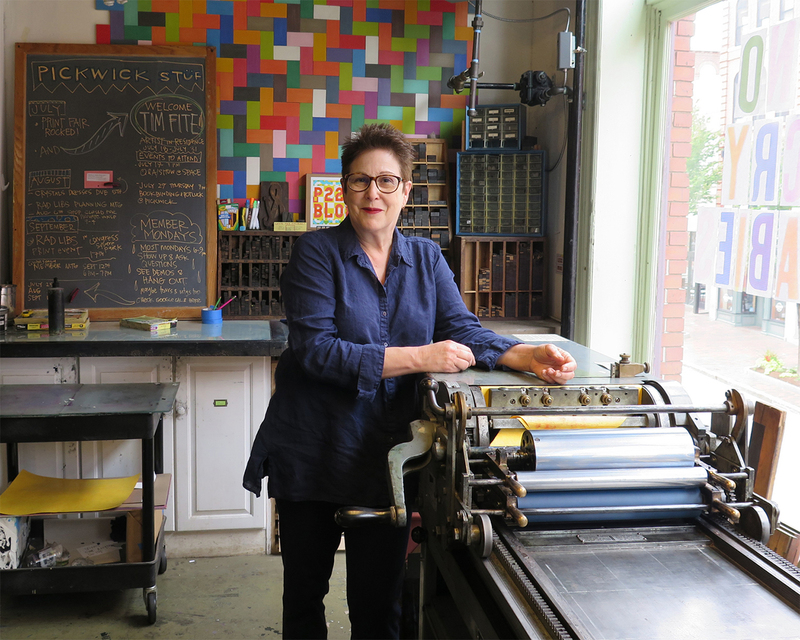 Big-hearted printer Jennie Putvin of Nane Press excels at breaking the mold as a side-business letterpress printer. 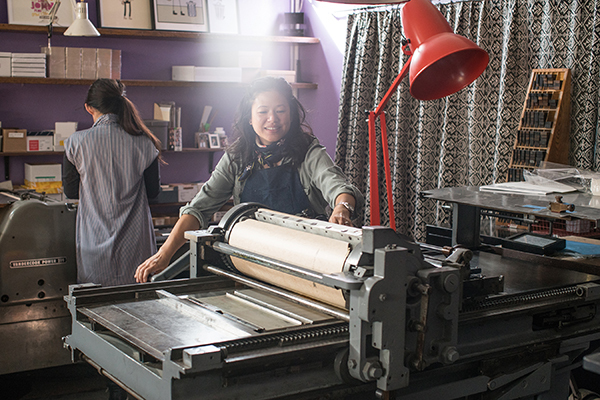 The tactically inclined and design-centric Jennie has been printing up a storm in her unique studio that gleans its creative current from surrounding artists within the building and from the fact that her studio is part of a refurbished church. 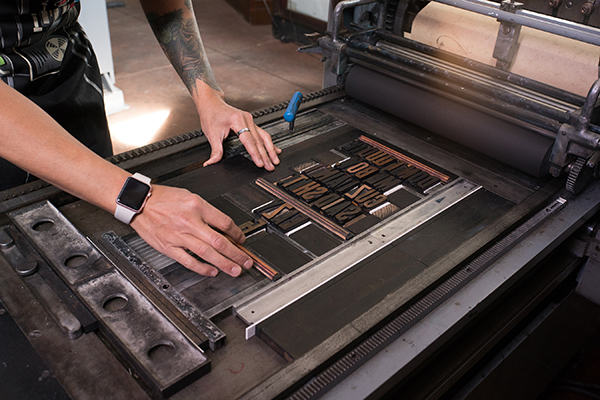 We caught up with her between late night print runs to check out how beautiful the perfect balance of makeready can be to the thrill of holding the final finished custom letterpress piece. 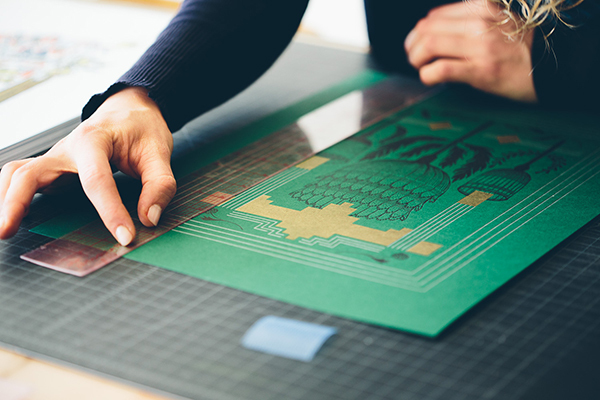 A LOVE FOR PRINTING At my day job I’m a graphic designer, but at heart I’m a craftsperson. Letterpress printing is a great marriage between the two; making something wonderfully tactile with your own two hands gives you a sense of satisfaction you just can’t get sitting in front of a computer. HOME IS WHERE THE PRESS IS My studio is in a refurbished church with gorgeous original details and kooky additions. While I’m the only printer in the space, other artists of different disciplines are always working and creating. Feeding off the creative energy in the environment is definitely something that keeps me going. NATURAL BORN PRINTER I took printmaking classes in college, and as a designer, I’ve always been interested in type and book design. 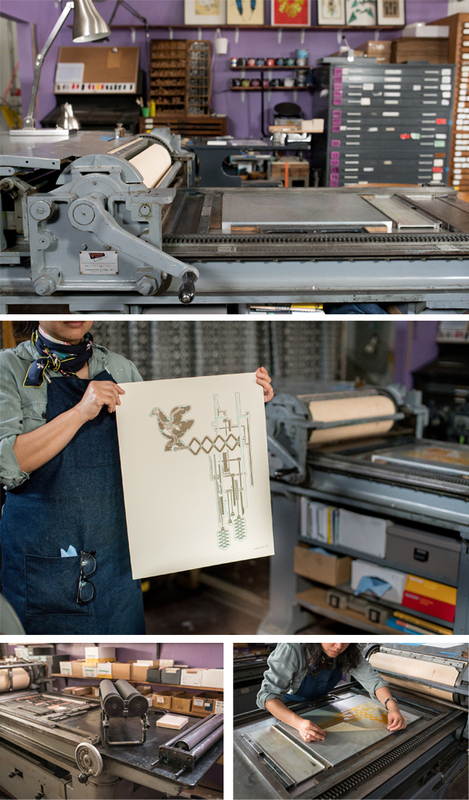 So it sort of came as a natural progression to take my first letterpress printing class at the Center for Book Arts in New York City. It was also great to be able to rent studio time in their facilities before I bought my first press. DESIGNED FOR PRINT I design and print my own work, as well as print other people’s designs. 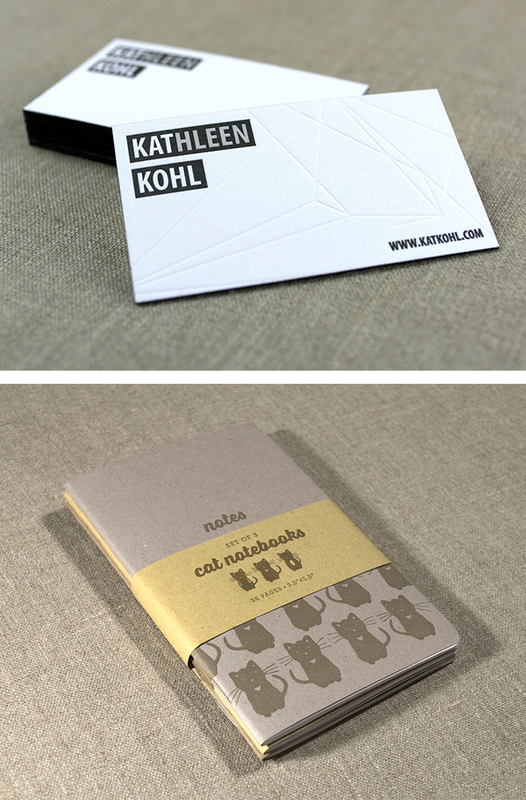 Other designers’ work always poses an interesting technical challenge, and I think makes me a better printer. THE CREATIVE FLOW I’m always collecting images and writing down ideas. For custom jobs, I always make an inspiration board with a color palette. Some of my projects are hand-illustrated, and some are only type-based. In the past, each of my designs has been tailored towards a specific client, but I’ve got plans to start building cohesive ready-made designs that look more like my personal style. FULL TIME FUN I don’t print full-time, but I would love to one day! 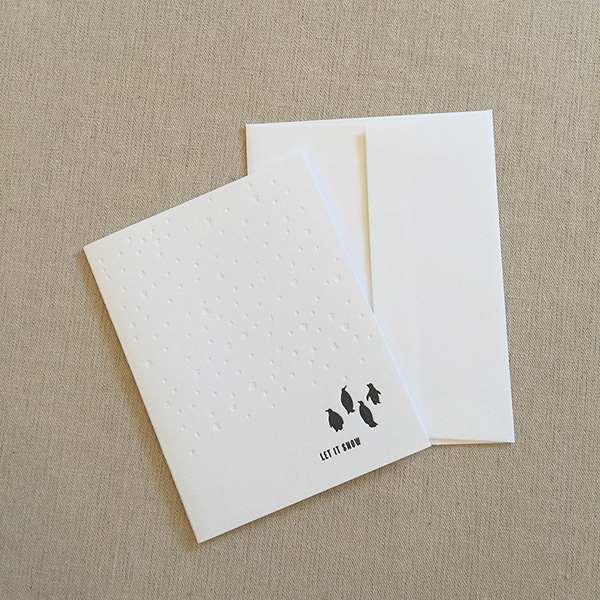 PRINTING FEATS Paper has the ability to impact people’s daily lives in a very unique way. 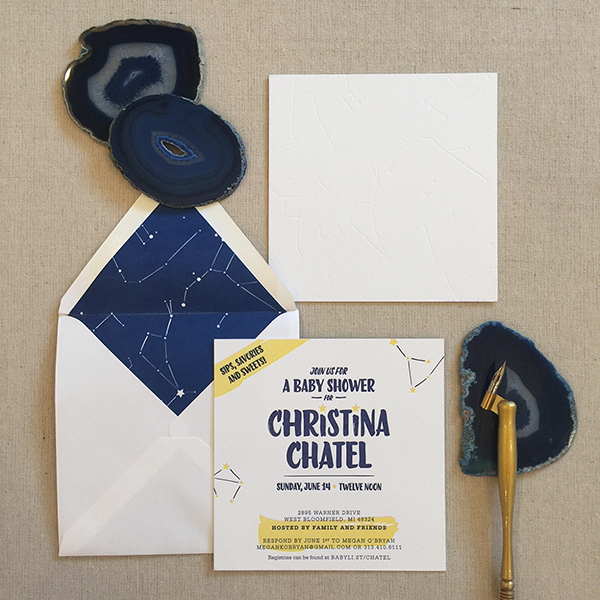 I’m always excited when my work is shown in galleries or published in a book—but when I hear that someone has received an invite or card I’ve printed and loved it enough to save it, well, that’s the best compliment a girl can get! BOXCAR’S ROLE The great folks at Boxcar help me troubleshoot along the way. If there’s a part of a design that’s going to be challenging for the plate to print (usually with punctuation in a thin font), I get a call from them with the heads-up. Knowing more about the limitations of the photopolymer has probably saved me dozens of hours of headache on the backend. PRESS HISTORY A Vandercook Universal I. Her name is Phyllis, and she’s a great press. SHOP TIPS I couldn’t live without my calipers. My shop isn’t humidity-controlled, and I spend a decent amount of time getting packing right. I’m always swapping in and experimenting with different types of paper, and knowing how thick your makeready is before you disassemble what’s under the drawsheet takes out a lot of guesswork. WHAT’S NEXT I’ve got a collaboration in place with a calligrapher that I’m super excited about. I also just got a die-cutting jacket for the press, so I’m really looking forward to experimenting with that! 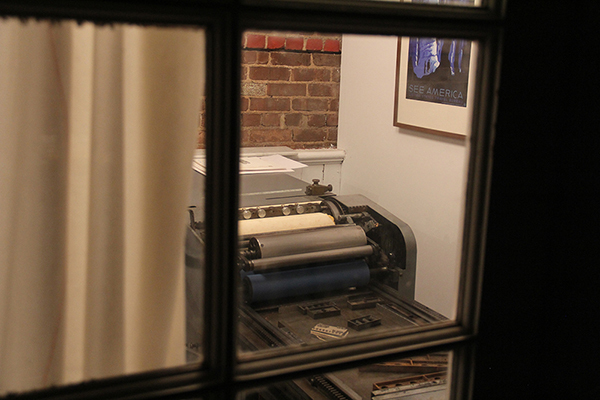 A huge round of thanks to Jennie of Nane Press for letting us catch up with the delights of her printing abode. 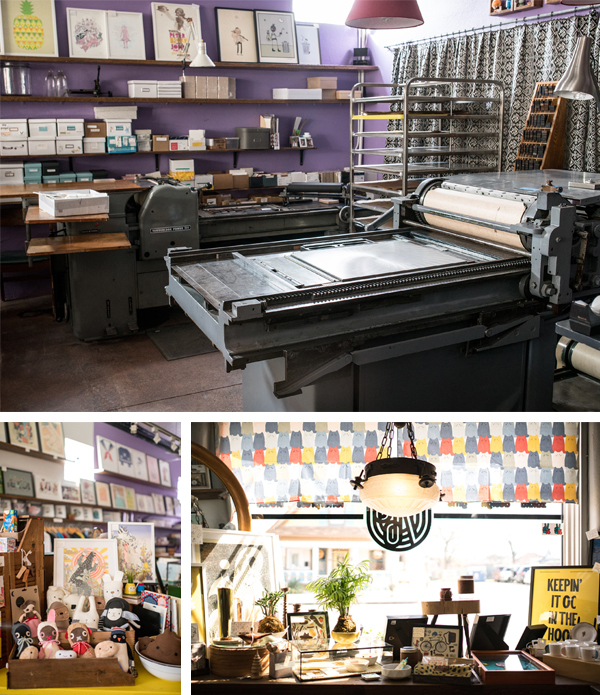 One of the best types of letterpress print shops is cozy (but mighty!) — one where you can kick up some beautiful prints, sway to some good tunes, and enjoy a good scone or cookie (or two) from the local bakery just a stone’s throw away. 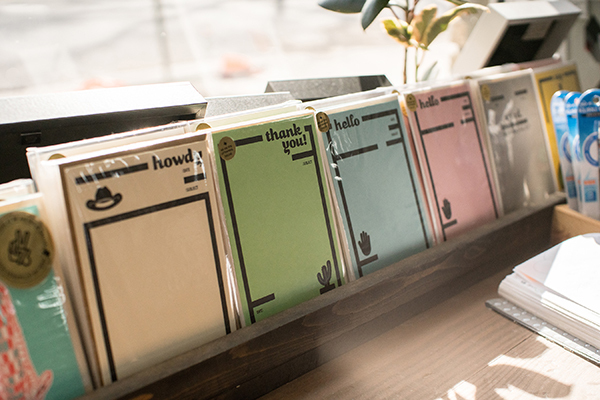 If this sounds like a printing haven to you, Nane Press (rhymes with rain) in Red Hook, Brooklyn is a must-see. Jennie Putvin will be be slinging ink with a cheery smile on her face when you walk in to her printing abode (just be sure to say hi to Bradley the shopcat while you’re there). MEET THE PRESSES I have two presses: a Vandercook Universal I (her name is Phyllis) and a C&P Oldstyle 10×15 (his name is Bill). I love them both and feel so lucky to have met them. SIZE OF PRESS SHOP A small but mighty 300 square feet! THE LOCATION My studio is an old church in Red Hook, Brooklyn. Red Hook is a great neighborhood full of artists and makers right by the water, a little off the beaten path. On long workdays (and, let’s be honest, shorter ones too) I always make my way over to the local bakery, Baked. They have a breakfast cookie that is to die for. The pier with amazing views of the city is also a 5-minute walk away. In a city full of tiny spaces, being in a church with 3 stories of open air in the middle is amazing. I sublet from an artist who makes robots and kinetic sculptures, so there is always something interesting happening in the space! FAVORITE THING ABOUT THE SHOP I have my own space, which is great. And I have a full cabinet of adjustable furniture, which I hear is a rarity. 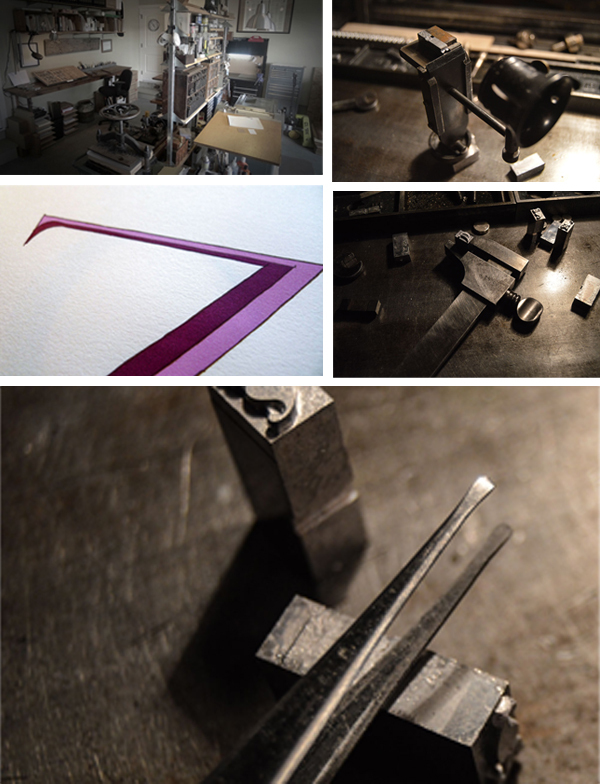 I love the idea of a little perfect set of tools making its way through time, finding its way to my printshop. I’m constantly rolling through Pandora playlists. Usually I listen to mellow folksy music, but the hiphop makes its way out after 9pm. I also have some large prints hanging up and some gorgeous antique schoolhouse lights I installed myself. We also have an ornery shopcat named Bradley. NUMBER OF PRINTERS IN SPACE I’m the only printer in the space, and my rooms are private. But there’s a full metal shop on site, which comes in quite handy when you need any kind of a tool for a press repair! I CAN’T WORK WITHOUT My Schaedler rule. I’m obsessed with making sure things are straight, and I’m totally lost without it. THINK PINK INK I use Van Son Rubber based inks. I was completely obsessed with neon pink 806 for awhile, but I think I’m currently in between favorite colors. I guess you could say I’m playing the field! KEEPING IT CLEAN I use mainly Crisco, and then Gamsol Odorless Mineral Spirits to finish. Not having an HVAC system, I looked at a lot of different options when I got my first press, looking for the lowest amounts of VOCs in my cleanup as possible. My system works great, and I haven’t really noticed any wear or pitting on the rollers. DRESSING THE PRESS I have a Boxcar 9×12 base for the Vandercook. I used to use the 94FL plates, which I loved. I’ve just switched to the KF95 and those work great, too. I’ve just got the C&P up and running, so I have to do some experimenting with my current base, because I want whatever system I have going forward to be able to work with both presses. OIL OF CHOICE I have a bottle of 3-in-1 that works great. WHAT TYPE OF RAG DO YOU CLEAN UP YOUR PRESSES WITH I’m all about the roll of reused cotton rags from the painting department at Home Depot. They’re amazing — no lint and heavy duty. FLOORING MATERIAL When Paul Moxon came by a couple years ago, I think he commented that I had the most uneven floor he’d ever seen. Because the floor has been recovered in the past to preserve and replace the original wood, the floor in my rooms is made of about 3 different materials. This is going to sound totally shady (it’s not though, I swear), but there’s actually a raised spot that gives right in the footpath in front of the Vandercook, so I don’t even need a floor pad. FLOOR PLAN TIPS In such a small space, I’ve just got everything lining the walls as much as possible. I need every square inch to move around in! But having your ink right next to the press is essential. KEEPING IT ORGANIZED Let everything get into complete disarray until I can’t find anything and I start knocking things over, and then do a major overhaul cleanup. I’m joking (but only a little bit)! I don’t keep parent sheets of paper on hand since I don’t have a guillotine, so I really have to keep my paper and envelope stock organized and separate, otherwise the overrun from jobs builds up and there’s towering stacks of paper everywhere. PRINTING TIPS Push everything a little too far before you pull it back. That goes for inking, impression, and design. I look back on old jobs and on a lot of them there’s always a little nitpicky thing I would have done differently. But I think that’s part of the process of growing as a craftswoman. It’s important to challenge yourself. Sometimes that extra hour (or two, or three!) you spend on makeready makes all the difference in the world.